All second level schools will open as usual tomorrow after the Association of Secondary School Teachers in Ireland suspended its industrial action. The union and the Department of Education have both accepted an invitation from the chair of the Teachers' Conciliation Council, Anna Perry, to attend talks with her tomorrow. Ms Perry is also Director of Conciliation Services at the Workplace Relations Commission. The two sides will meet Ms Perry separately for initial talks to explore possible solutions to the disputes, which have seen hundreds of schools closed for three days over the past number of weeks. Both sides had been engaged in talks but with no progress. The union has suspended both its one-day strikes over the issue of pay for more recently qualified teachers, and also its withdrawal from the supervision of students. This latter action had resulted in the closure of around 400 schools, and threatened their closure for an indefinite period of time. 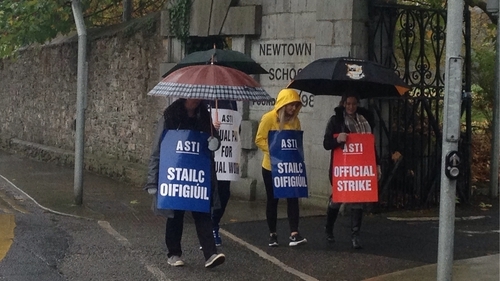 From tomorrow ASTI teachers will supervise students during school break-times. Minister for Education Richard Bruton has welcomed the invitation to talks and also the ASTI's decision to suspend industrial action. In a statement the Department of Education confirmed it has accepted an invitation from Ms Perry to meet tomorrow. The Deputy General Secretary of the ASTI, Diarmaid de Paor, has said that there may not be a solution in the talks with the Teachers' Conciliation Council because the discussions with Department of Education officials had been "very difficult" and both sides were "a long, long way apart". However speaking on RTÉ's Prime Time, Mr de Paor said it was helpful that a third party had intervened in the dispute. He confirmed that the talks with the Teachers' Conciliation Council would begin tomorrow. Meanwhile, the Taoiseach has said the Government will continue to stand by the Lansdowne Road Agreement ahead of further talks with public sector trade unions on the issue of pay.